The Debutante has a more square case at the lug ends. If the jewel count is 7J, I would go with the "Miss Liberty" as shown in the ad below...The jewel count and angled corners help on this one. Can't see jewel count on the debutante (cut off). These are fun to correctly ID. Case dimensions may help also as several of the Ladies are similarly shaped yet sized differently. 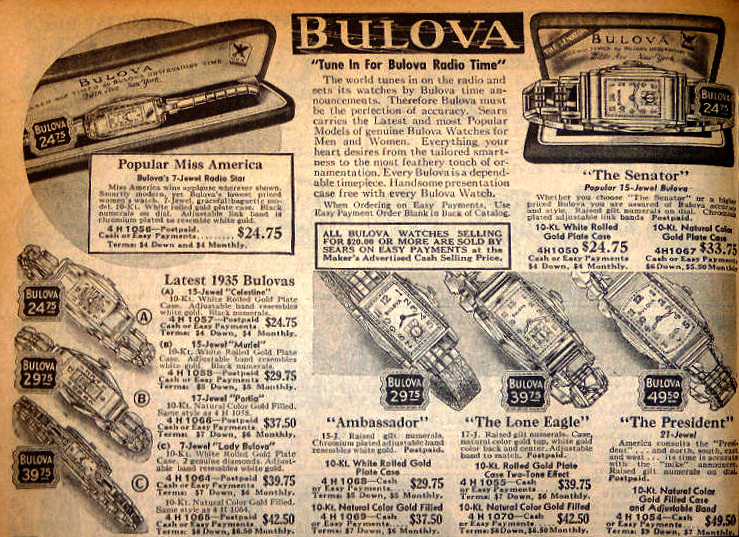 The 'LADY BULOVA' ad is Dated 1935, from what Year is the 'MISS LIBERTY' ad? Shown above is what is advertised in 1935 as the 'LADY BULOVA' - and don't feel bad, the Ladies are confusing for all of Us. Not if the Jewel count differs, but this Watch is in a box marked 'DEBUTANTE' so perhaps it is?